An electronic health record (EHR) or electronic medical record (EMR) is a collection of digitally-stored patient health information. EHRs offer up-to-date patient records with readily available information that can be accessed securely by authorized users through the Internet or internal databases. Among other information, an EHR may contain a patient’s diagnosis information, current and past medications, treatment plans, lab results, family health history, immunization dates, allergies, and radiology images. There are some challenges associated with gaining access to EHRs. Sometimes an attorney reviewing EHRs finds documentation describing what a healthcare provider did is missing. What are the possible reasons for this? The procedure or care in question may have been done, but the provider forgot to chart it, was too busy, or distracted. The care in question may be documented by someone else in the medical record. The care was not completed. EHRs are typically administered through a hospital or medical clinic by a commercial vendor. These vendors usually have nondisclosure and indemnity clauses as well as maintenance and troubleshooting protocol. Digitally accessible records may be at risk for third-party data collection, compilation, manipulation, and deletion. Additionally, some issues may emerge with EHR systems in regards to user interface display, electronic chart population, and accuracy and completeness of a patient’s file. In addition, it’s important to know that EHRs do not include some digital records, such as videos of procedures (e.g., Laparoscopic surgery). Video records are housed on separate systems from EHRs. When an adverse event occurs while a patient is under the care of a doctor, the incident should be carefully documented. Details about the event, including the date, time, location, and names and relationships of the people present should be filed. Additionally, the patient’s clinical information, their condition before and after the occurrence, and any medical or therapeutic intervention following the incident, should be recorded. Healthcare providers are responsible for recording accurate medical information. In addition, it is their duty to review all necessary patient information before diagnosis or treatment. The medical malpractice lawyers at Miller & Wagner are experts at navigating this complex system. Our lawyers take into account potential corporate negligence issues with respect to the use of an electronic system, the remediation of problems, and the policies and procedures that govern the use of digital medical records. 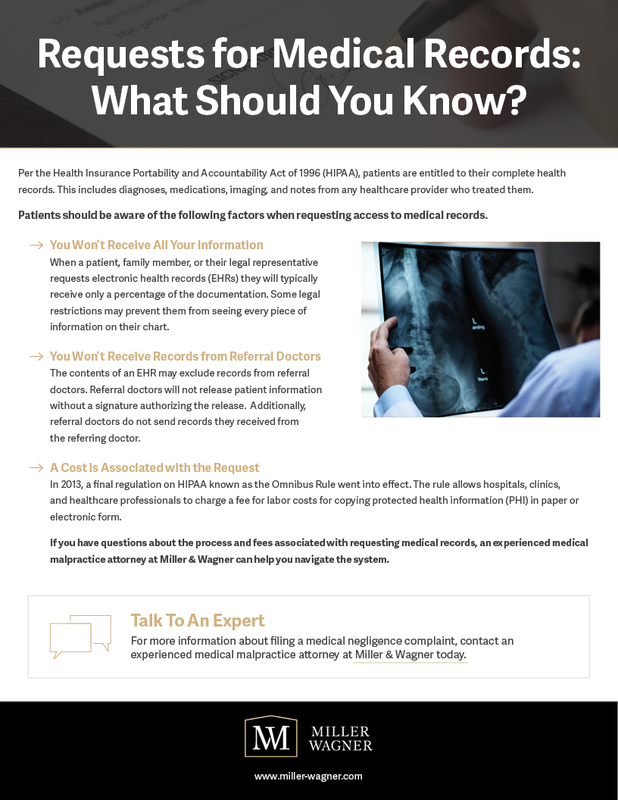 If you or a member of your family were injured to do a physician’s failure to properly and thoroughly review health records, contact an experienced medical malpractice attorney at Miller & Wagner today.